The Holy Eucharist is the sacrament commanded by Christ for the continual remembrance of his life, death, and resurrection, until his coming again. Why is the Eucharist called a sacrifice? Because the Eucharist, the Church’s sacrifice of praise and thanksgiving, is the way by which the sacrifice of Christ is made present, and in which he unites us to his one offering of himself. By what other names is this service known? The Holy Eucharist is called the Lord’s Supper, and Holy Communion; it is also known as the Divine Liturgy, the Mass, and the Great Offering. What is the outward and visible sign in the Eucharist? The outward and visible sign in the Eucharist is bread and wine, given and received according to Christ’s command. What is the inward and spiritual grace given in the Eucharist? The inward and spiritual grace in the Holy Communion is the Body and Blood of Christ given to his people, and received by faith. What are the benefits which we receive in the Lord’s Supper? The benefits we receive are the forgiveness of our sins, the strengthening of our union with Christ and one another, and the foretaste of the heavenly banquet which is our nourishment in eternal life. What is required of us when we come to the Eucharist? It is required that we should examine our lives, repent of our sins, and be in love and charity with all people. For 2000 years, Holy Eucharist remains the principal act of Christian worship. The worship on each Sunday morning is the most important thing we do together as a Christian community. Parts of what we say date from the time of Jesus Christ and the early Church. Some portions of our service come to us from many years before Jesus. The Holy Eucharist guides, nourishes and sustains the Christian mission and ministry. As Episcopalians, the liturgy we celebrate together reminds us again and again each week that we are God’s holy people. At St. John’s we follow the order of worship as written in the 1979 Book of Common Prayer. 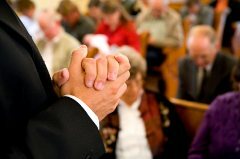 Who can receive Communion in the Episcopal Church? In the Episcopal Church, all baptized Christians are welcome to receive Communion. One does not have to be an Episcopalian to receive Communion. Can I just come and receive a blessing instead of Communion? Yes. If you are not baptized, you are encouraged to come to the altar at the time of Communion and receive a blessing from the priest. Please cross your arms in front of your chest to indicate this. Must I receive both Bread and Wine? No, you don’t have to. You may receive just Bread. Must I drink from the common chalice? If you do not wish to drink from the chalice, please hold the host up for the Eucharistic Minister and allow the Minister to intinct the host in the wine and put it in your mouth. What happens in the Holy Eucharist? The service begins with a musical prelude. This is a time for quiet reflection before worship. As the organist begins the processional hymn, the congregation stands to sing the hymn. Hymns have been central to Christian worship since the earliest days of the church. The ministers will process down the aisle behind the cross. Led by a crucifer, the procession may consist of acolytes (those who assist the clergy), the choir, lay ministers and readers, and the priest. They enter, wearing white garments called albs, which are derived from everyday clothes of the Roman times. The priest wears the colored stole, which symbolizes the yoke of Christ. The presiding priest wears the chasuble, which is derived from a common outer travelling garment in the Roman times like a poncho. After the processional hymn, the priest begins invoking the name of the triune God, Father, Son and Holy Spirit. Many Episcopalians make the sign of the cross at the Name of the Trinity: Father, Son, and Holy Spirit. We make the sign to remember when we were signed with the cross and in the name of the Trinity at our baptism. The priest says the Collect for Purity, an ancient prayer, from the eighth-century attributed to Gregory of Canterbury. The Bible records the story of God’s salvation, which was first revealed in the history of the ancient people of Israel, then in the life and death of Jesus Christ and in the Church after Jesus’ Resurrection. Whenever God’s people gather as a community to worship, the Word of God is read and heard. The Lector or the Lay Reader goes to the Lectern to read from the Bible. The first reading may be from the Old Testament—the history, prophecy and wisdom literature of the ancient people of Israel. This is followed by a Psalm from The Book of Psalms, the longest book in the Bible with 150 individual sacred songs, poems, and prayers. They were used in the worship services of ancient Israel. Psalms focus the worshiper's thoughts on God in praise and adoration. This may be sung or may read by the lector and the congregation. The Lector now reads the appointed selection from the New Testament Epistles which witness to the mission and life of the first generation of the Christians. The Gospel-book is “processed” back to the Altar and the congregation sits to hear a sermon, an address which seeks to bring the Word of God, recorded in the Scriptures, to bear on our own lives. Having heard the sermon, the congregation stands to reaffirm the faith by saying together the Nicene Creed. This is the ancient summary and proclamation of the Christian faith, in which we affirm our faith in God the Father, God the Son, God the Holy Spirit. We, then, bring our needs and our concerns in prayer, using one of the six forms of the Prayers of the People. We pray for the world of which we are a part, for the Church that it may be faithful to the gospel, for the needs of others, for the sick and the suffering and for the departed, those members of the body of Christ who are united with us on earth and in heaven in the presence of God. Then, we confess our sins asking for God’s forgiveness. The priest pronounces absolution according to the authority which Jesus has given to his Apostles and to the Church. Our sins are forgiven. Before we offer to God the fruit of his creation at the Altar, we make our peace with one another, reconciling ourselves to one another as God has reconciled us to himself in Christ’s sacrifice on the Cross. The Ministers and the People may greet one another in the name of the Lord. A simple handshake and the words, “Peace be with you” is traditional. Following The Peace, the congregation makes its offering. With the offertory sentence, begins the second part of the liturgy, the Holy Communion. Here, a hymn may be sung as ushers pass the collection plates. The offertory is not just “taking up the collection.” It is a time when we prepare to offer our whole lives up to God. During the hymn, the priest and servers prepare the altar. The priest washes hands in ritual purification. When the collection has been taken, the offerings are presented by members of the congregation to the priest to be offered to God as we sing the “Doxology”, our hymn of praise to God. The priest, then, begins the Eucharistic Prayer, also called “the Great Thanksgiving.” This prayer is the most important and the most ancient prayer with Jesus’ own words of institution at the heart of it. Its origin dates back to the times of the Apostles. The Eucharistic Prayer recalls once more the story of the salvation of God, who has created us in his image, who has redeemed us by the incarnation and crucifixion of Christ his Son, and has sanctified us with his Holy Spirit, calling us to become the children of God. As we approach the moment of Holy Communion, we pray in the words that Jesus himself taught us, the Lord’s Prayer. We, then, sing the Agnus Dei, the words with which John the Baptist acclaimed Jesus as the sacrificial Lamb of God. Then, we approach the Altar with reverence. The Episcopal Church encourages people to receive their communion in both kinds (bread and wine), although you may wish to receive just the host. After the Holy Communion, and we thank God for the gift of his grace in the sacrament. We have received the living presence of Christ crucified in us, and we pledge our lives in the service of God, as a holy living sacrifice for his glory. Christians are to be the salt of the earth and the light of the world. We come to receive the Body and Blood of Christ in order that Christ may dwell in us and be known to the world through us in our daily life. So, the Eucharist ends with a commission, which sends the Christian out on a journey. We are blessed in the name of the triune God, Father, Son and Holy Spirit. God is the source of all being and gives life to the whole world. As we sing the final hymn before the dismissal, the ministers and the servers process out. In the peace of Christ, we are sent forth to love and serve the world in the name of Christ as Christ has love and served us.